Your first pair of padded bike shorts can be an intimidating purchase, but that thin layer of spandex will make all the difference as your rides increase in distance. Wearing a padded bike short will add comfort to your ride and help protect against saddle sores. Cycling shorts are specifically designed to protect the rider against friction generated by contact with the saddle. This means biking shorts can help you avoid those dreaded saddle sores! Remember, when undertaking a daylong or multiday ride, it’s just as important to protect your behind as other contact points, such as your feet and hands. There are two styles of cycling shorts. Both are built around a padded chamois layer that is sewn into a close-fitting pair of shorts. Road riders typically wear tight-fitting padded cycling shorts, whereas commuters and mountain bikers often wear a lighter weight mesh version of these under a pair of overshorts. Both traditional cycling shorts and “baggies” come in “bib” and standard versions. A bibshort has straps that function as built in suspenders, designed to increase comfort and coverage. Keep in mind if you choose bibs you have to take off your jersey to use the restroom. You should LIKE and feel COMFORTABLE in whichever shorts you choose. There’s no official rule that says you can’t wear baggies on the road or vice versa. Different brands and styles of cycling shorts have different densities and amounts of padding. Keep in mind that more padding doesn’t necessarily mean more comfort. Try on a few brands and styles to find what feels best. You will also find different thicknesses in Lycra. Choose a thinner layer for warm temperatures and a thicker layer for the shoulder seasons and winter. To ensure the best fit with your bike shorts, don’t forget that many companies make shorts specifically for males and females. Padded bike shorts are designed to be worn without underwear! You’ll soon see that wearing underwear not only looks funny but is uncomfortable too. Consider purchasing two pairs of shorts—preferably with two different styles of chamois. 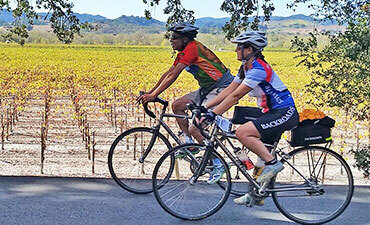 On multiday rides, rotate between the two pairs to prevent saddle sores. Ensure your cycling shorts provide adequate coverage when you lean forward into a cycling position. Bibs can eliminate the problem of shorts lacking coverage. If you choose to purchase a bib pant, the shoulder straps go under your cycling jersey. If riding during the shoulder seasons or in a colder climate, buying a pair of cycling leg warmers will take the chill out of the mornings and late afternoons. No matter how comfy your old shorts are, be sure to retire them when the material becomes threadbare. This will be more comfortable for you…and your fellow riders!